You Are Richer than John D. Rockefeller? 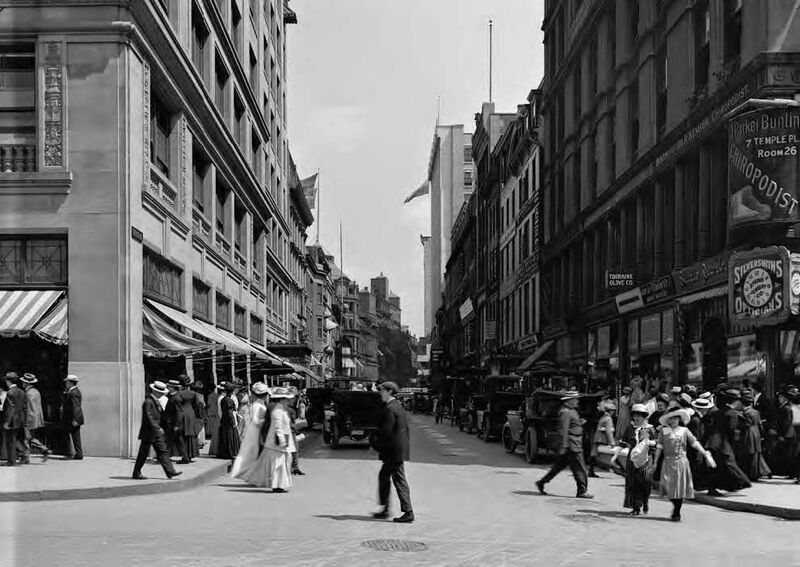 This Atlantic story reveals how Americans lived 100 years ago. (HT Warren Smith) By the standards of a middle-class American today, that lifestyle was poor, inconvenient, dreary, and dangerous. (Only a few years later—in 1924— the 16-year-old son of a sitting U.S. president would die of an infected blister that the boy got on his toe while playing tennis on the White House grounds.). So here’s a question that I’ve asked in one form or another on earlier occasions, but that is so probing that I ask it again: What is the minimum amount of money that you would demand in exchange for your going back to live even as John D. Rockefeller lived in 1916? 21.7 million 2016 dollars (which are about one million 1916 dollars)? Would that do it? What about a billion 2016—or 1916—dollars? Would this sizable sum of dollars be enough to enable you to purchase a quantity of high-quality 1916 goods and services that would at least make you indifferent between living in 1916 America and living (on your current income) in 2016 America? Think about it. Hard. Carefully. If you were a 1916 American billionaire you could, of course, afford prime real-estate. You could afford a home on 5th Avenue or one overlooking the Pacific Ocean or one on your own tropical island somewhere (or all three). But when you traveled from your Manhattan digs to your west-coast palace, it would take a few days, and if you made that trip during the summer months, you’d likely not have air-conditioning in your private railroad car. And while you might have air-conditioning in your New York home, many of the friends’ homes that you visit—as well as restaurants and business offices that you frequent— were not air-conditioned. In the winter, many were also poorly heated by today’s standards. To travel to Europe took you several days. To get to foreign lands beyond Europe took you even longer. Might you want to deliver a package or letter overnight from New York City to someone in Los Angeles? Sorry. Impossible. You could neither listen to radio (the first commercial radio broadcast occurred in 1920) nor watch television. You could, however, afford the state-of-the-art phonograph of the era. (It wasn’t stereo, though. And—I feel certain— even today’s vinylphiles would prefer listening to music played off of a modern compact disc to listening to music played off of a 1916 phonograph record.) Obviously, you could not download music. There really wasn’t very much in the way of movies for you to watch, even though you could afford to build your own home movie theater. Your telephone was attached to a wall. You could not use it to Skype. Your luxury limo was far more likely to break down while you were being chauffeured about town than is your car today to break down while you are driving yourself to your yoga class. While broken down and waiting patiently in the back seat for your chauffeur to finish fixing your limo, you could not telephone anyone to inform that person that you’ll be late for your meeting. Even when in residence at your Manhattan home, if you had a hankering for some Thai red curry or Vindaloo chicken or Vietnamese Pho or a falafel, you were out of luck: even in the unlikely event that you even knew of such exquisite dishes, your chef likely had no idea how to prepare them, and New York’s restaurant scene had yet to feature such exotic fare. And while you might have had the money in 1916 to afford to supply yourself with a daily bowl full of blueberries, even for the mighty-rich this expense was likely not worthwhile. Even the best medical care back then was horrid by today’s standards: it was much more painful and much less effective. (Remember young Coolidge.) Antibiotics weren’t available. Erectile dysfunction? Bipolar disorder? Live with ailments such as these. That was your only option. You (if you are a woman) or (if you are a man) your wife and, in either case, your daughter and your sister had a much higher chance of dying as a result of giving birth than is the case today. The child herself or himself was much less likely to survive infancy than is the typical American newborn today. Dental care wasn’t any better. Your money didn’t buy you a toothbrush with vibrating bristles. (You could, however, afford the very finest dentures.) Despite your vanity, you couldn’t have purchased contact lenses, reliable hair restoration, or modern, safe breast augmentation. And forget about liposuction to vacuum away the results of your having dined on far too many cream-sauce-covered terrapin. Birth control was primitive: it was less reliable and far more disruptive of pleasure than are any of the many inexpensive and widely available birth-control methods of today. Of course, you adore precious-weacious little Rover, but your riches probably could not buy for Rover veterinary care of the sort that is routine in every burgh throughout the land today. You were completely cut off from the cultural richness that globalization has spawned over the past century. There was no American-inspired, British-generated rock’n’roll played on electric guitars. And no reggae. Jazz was still a toddler, with only a few recordings of it. You could afford to buy the finest Swiss watches and clocks, but even they couldn’t keep time as accurately as does a cheap Timex today (not to mention the accuracy of the time kept by your smartphone). Honestly, I wouldn’t be remotely tempted to quit the 2016 me so that I could be a one-billion-dollar-richer me in 1916. This fact means that, by 1916 standards, I am today more than a billionaire. It means, at least given my preferences, I am today materially richer than was John D. Rockefeller in 1916. And if, as I think is true, my preferences here are not unusual, then nearly every middle-class American today is richer than was America’s richest man a mere 100 years ago.